Our world is quickly becoming acidic. From the highly processed, saturated fats we consume to the carbonated and caffeinated beverages we drink then add the hectic, stressful lifestyle we live, our bodies are struggling to maintain the proper pH balance it needs to survive – let alone strive! From that deep growing need we have sprouted Core Greens, a complete alkalizing superfood. 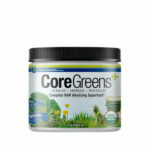 Core Greens contains 14 RAW superfoods that are rich in enzymes and nutrients to alkalinize the body while providing cleansing and healing of our delicate internal eco-system. Each certified organic, RAW ingredient has been hand-selected for its alkalizing properties from the richest soils to maximize the highest nutrient content available.